This wine was one of the first to be harvested in 2007! 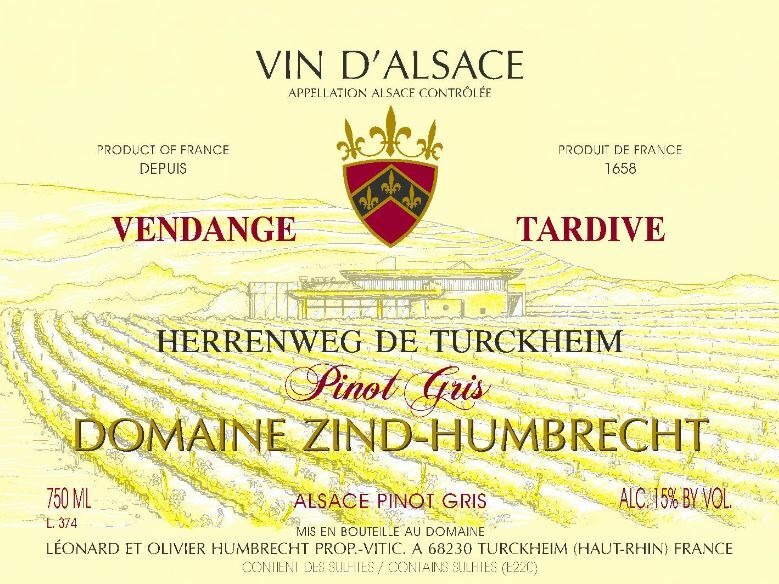 Vendange Tardive may mean ‘late harvest’, but in Alsace it means also that the grapes reached a certain ripeness level. If the vineyard is very precocious, which is the case of the warm gravely soils of the Herrenweg, the viticulture allows small yields and good bio-dynamic farming ensures that there is a homogenous physiologic ripeness, than it is possible to make such wines quite early. The Herrenweg may not have the same minerality and vineyard influence as other more prestigious areas, but the earlier harvest brings a youth and freshness which makes it very attractive and pleasurable to drink early. For once I say: enjoy it now if you feel like it! 2/2009: this is classic Pinot Gris late harvest nose: fruity, honeyed, apricots, quince jelly aromas. It is an inviting wine, very attractive and with no surprise on the palate. The sweetness is harmonious, the richness avoids the wine to be too soft and the youthful character, due to excellent acidity, brings an immediate pleasure. This is a perfect introduction to VTs!